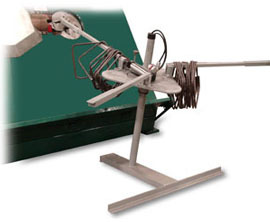 The KRB Parts Receiver helps your Automatic Stirrup Bending operators reduce repetitive motion injuries. The locking carousel has three arms that extent to catch closed parts falling from the machine. The system is easy to hook up. Simply plug the parts receiver into the KRB controller. The Controller sends a signal to the receiver upon the shearing process. An air cylinder extends the arm an allows the part to slide down the arm.